Population growth: The population of the world is growing and it is estimated that there will be 10 billion people on the planet by 2050. People's standards of living have also increased dramatically, especially in China and India. This has increased demand for dairy-based products which has increased prices with knock on effects on feed prices. Fuel costs: Fuel costs have increased rapidly over the last 10 years. This has directly impacted on feed prices as well as harvesting costs. Weather: Extremes in weather have become more evident in recent years, with colder and wetter summers in North Western Europe and hotter, drier weather in Southern Europe. This has dramatically affected production. The drought in the USA in 2012 has led to cereal shortages and higher prices. Lower producer margins due to lag effect: The biggest risk for producers is where input prices rise rapidly without corresponding increases at the retail level. This lag effect causes huge problems for producers. Ban on antibiotics: In-feed growth promoting antibiotic use is no longer a tool legally available to producers to enhance productivity and control diseases on farms (Regulations (EC) No. 1831/2003 and 1334/2003). Salmonella and E.coli remain common disease burdens on farms and increasingly require direct treatment with antibiotics by veterinarians and these also have reputational damage with the retailer. 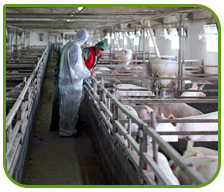 Reduced productivity: Animals fail to thrive when infected by pathogens such as E.coli and Salmonella. PCV-2 and other viral agents impact on productivity, thus requiring vaccination programs in many instances. In-feed antibiotics are associated with substantial increases in growth rate and feed efficiency. Since their ban in the EU, alternatives comparable in effect have not been found (e.g. prebiotics, dietary acidification, probiotics, herbs and spices). Furthermore, the use of zinc oxide in animal feed has already been banned in some counties in the EU. Thus, there remains no comparable solutions to these problems. Copyright © THRIVE-RITE. All Rights Reserved. This website is maintained by BioAtlantis Ltd., Kerry Technology Park, Tralee, Co. Kerry, Ireland.